RETHINK TO REBUILD YOUR WORKFORCE! Rescheduled Meeting Due to Weather! 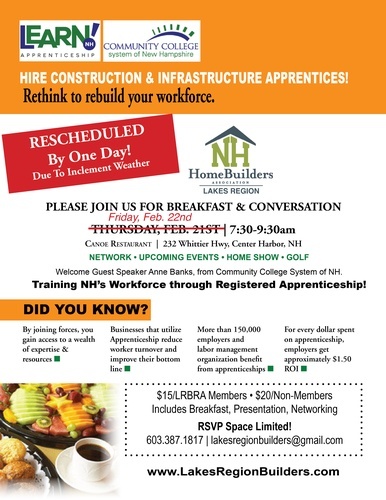 Please Join Us This FRIDAY (2/22/19) Enjoy Breakfast, Networking & Guest Speaker Anne Banks from Community College System of NH speaking on: Training NH's Workforce through Registered Apprenticeship! Businesses that utilize Registered Apprenticeship reduce worker turnover as a result of greater employee loyalty, increasing productivity and improving the bottom line.